So there I was, lined up at the starter’s line, waiting for the signal to leave. This was my first Pony Express, and I had to admit that I was feeling a bit anxious. I really wanted to do well. The 1964 El Camino that was in front of me at the start line was sent out about 30 seconds ago. I was nervously playing with my stop watch as I kept adjusting my helmet. The desert heat was already starting to get to me, and it wasn’t even noon yet. Finally the starter gave me the “get ready” signal. He started counting down the last 5 seconds as I revved the engine. Then-- the green light! I gave the starter a good-bye wave and simultaneously engaged the gear, started two stop watches and popped a tape into the radio. The combination of all these actions resulted in driver-induced stupidity-- I almost stalled the car!! Somehow, I was able to get my act together, pointed myself in the right direction and headed up the first hill. It was an ominous start. with my helmet on, the wind noise and the recording volume of the tape, I could barely hear my instructions. the tape deck in my car ran at a different speed than my tape deck at home, throwing off all my timing. Plan B was to use my regular stop watch. I had it dangling on my rear view mirror so I could check it quickly. I had written down on a piece of paper what my elapsed time should be at key mile markers. I had taped this paper to my steering wheel. And here’s how I defeated Plan B. After a couple of curves, the stop watch was starting to bother me as it swung into my field of vision. I took it off the rear-view mirror and threw it on the passenger seat-- immediately hitting the button that stops it. That’s why I always have a Plan C.
The clock in my car has a stop watch. I was able to turn this on a little after the start. It was my only point of reference with respect to time, which is everything in this race. The major advantage of this stop watch was that I couldn't reach it while I was driving. That significantly reduced the chances of me screwing it up. The disadvantage was that I didn’t know its accuracy. But I began formulating Plan D, just in case (one Mississippi, two Mississippi, ...). As it turned out, all my planning would be for nought, but I’m getting ahead of myself. There were about 100 cars that day. Here we are in the 110 mph group, waiting for them to send the Unlimited Group out first. My car is between the red El Camino and the red-orange Datsun 240Z(remember them?). At about 110 mph, the Porsche gets noisy with the windows down. Driving in the desert with the windows closed while wearing a helmet isn’t exactly breezy. 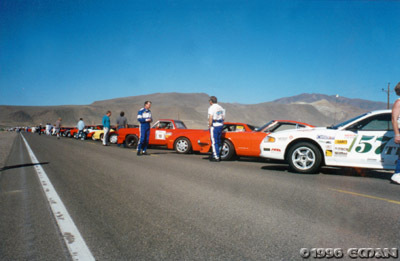 Consequently, the only time I turned on my air conditioner during my entire 5,000 mile vacation was during this race. As I was nearing the half-way point, I could to see the El Camino that was ahead of me. I kept my sights on him. After all, you can’t be in a race without passing someone. I could smell exhaust fumes as we approached to the “Narrows,” the twisty section of the road as it winds through some hills. I was getting ready to make my move on him at this point when the El Camino dusted me and my 944 through the twisties. Huh!? To this day, I’m still trying to come up with elaborate excuses on how a car 25 years older than the 944 (which is considered to be one of the best handling cars around, well, in its day), got left behind in the twisties. Of course, the first possible problem I eliminated was the driver. I’ve since narrowed it down to my car’s engine, suspension or the phase of the moon. I’m pretty sure the problem was one of these. I eventually did pass the El Camino when we got back to the straighter portions of the course. I tried to keep my speed at 115 mph, my fastest allowable speed, but towards the last part of the course, I knew that I was still running slow. I had lost too much time at the Narrows, so I was averaging well below 110 mph. I ran at 120 mph for a little bit, but it still wasn’t enough. Before I knew it, I saw someone at the side of the road waving a checkered flag at me. My race was over.